Give it a whirl and go for the curl, yellow curl that is. Yellow is the color of happiness and sunshine, so why wouldn't you want to add it to your gifts, decorations, or DIY crafting projects? Seeing a smile on someone's face before they open a gift is wonderful, but knowing it's because you put effort and ribbon into your gift, well that's a great thing! The bright yellow is sure to make everyone look. The curling ability of this awesome ribbon is just an added plus! This curling ribbon is great for tying balloons together, making streamers for your next summer party, or even decorating your child's hair for cheerleading! The versatile ribbon is sure to create a fun look into everything and anything it touches. 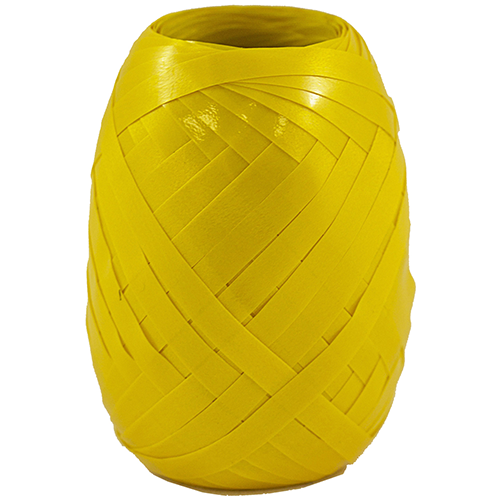 Yellow Curling Ribbon currently comes in ribbon eggs. These measure 66 feet and come in Jumbo Yellow and standard size (meaning the width is a little different).